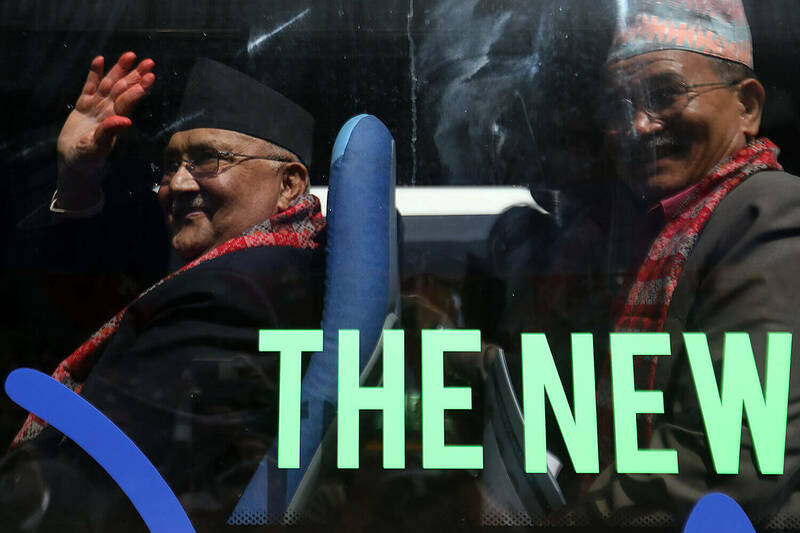 Prime Minister KP Oli on Tuesday announced a new action plan for electric transport that proposes to turn at least 20% of public vehicles into battery operated ones by 2020. 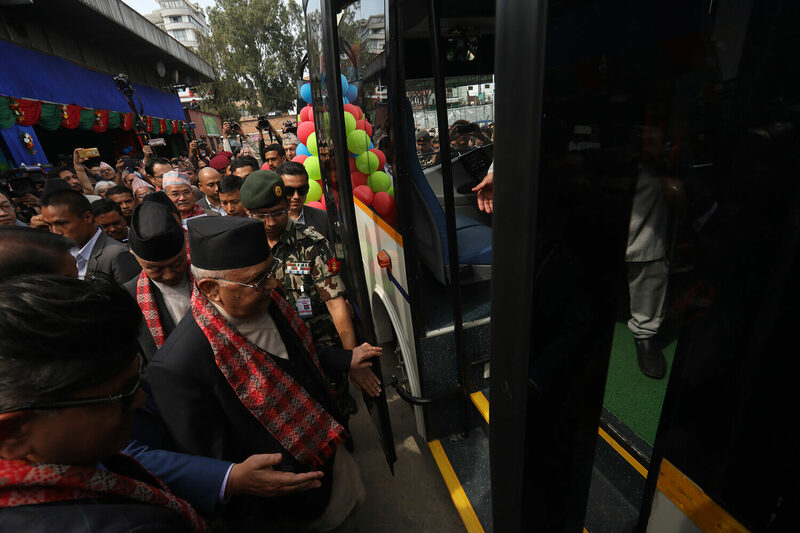 Inaugurating the first five electric buses inducted by Sajha Yatayat on Tuesday, PM Oli also said that Nepal will reduce its dependence on fossil fuel by half by 2050. 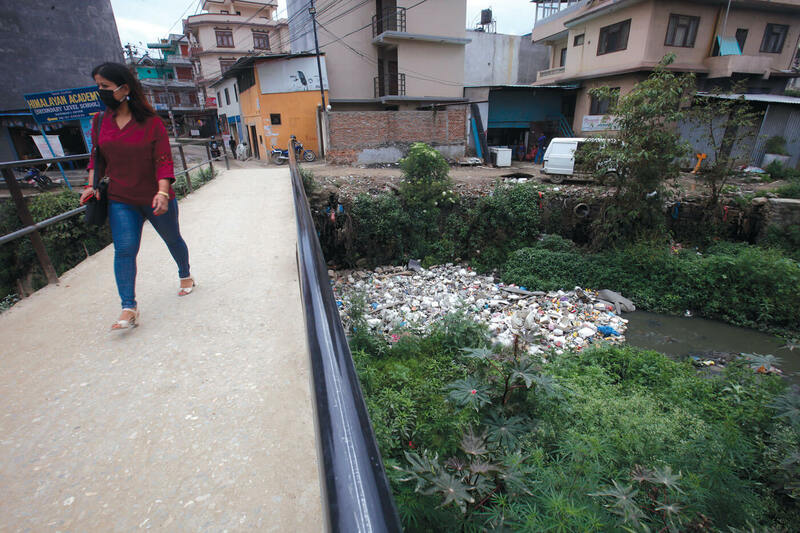 The strategy is for Nepal to be self-reliant in hydropower in a few years, and make electricity cheap enough to encourage private and public vehicles to be battery-operated, displacing dirty and imported fuel with the domestically-generated clean energy. Oli may be biting off more than he can chew, however. Analysts say it will be an uphill task to turn one-fifth of diesel buses into electric in just two years. Nepal imported more than 100,000 diesel-run buses, mini buses, micro buses, jeeps and three-wheelers in the last 25 years, and most of them are still in operation. Nepal will have to import at least 20,000 electric buses to achieve the ambitious goal announced by Oli, but that is seen as unlikely given how slow the country has been in providing incentives to electric vehicles. In his carefully-crafted speech, Oli also unveiled the country’s first-ever National Plan of Action for Electric Mobility. The strategy is based on a set of Nationally Determined Contributions (NDC) that Nepal agreed to at the Paris Climate Conference in 2015. In its policy document on NDC, Nepal had vowed to convert 20% of its public vehicles to electricity in five years. 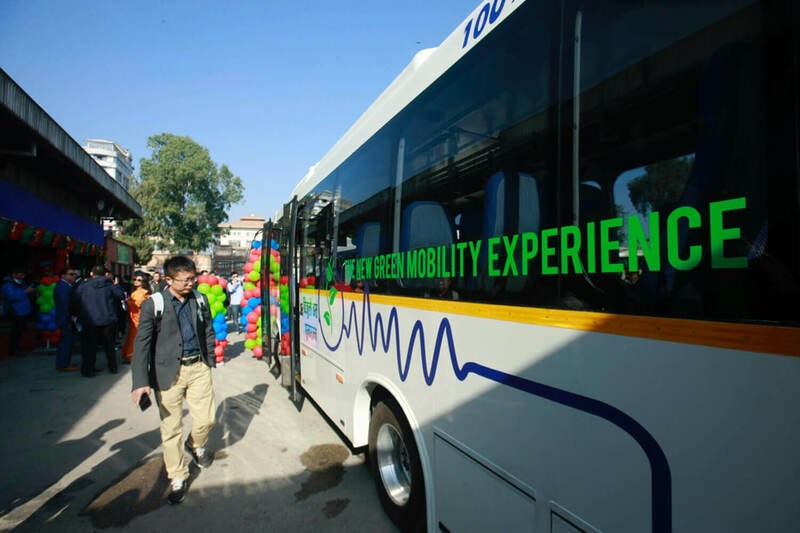 Three years have already passed, but the first five electric buses will finally be plying on the streets of Kathmandu. The Chinese BYD buses were originally provided to Lumbini Development Trust by the Asian Development Bank, but since the Trust could not use them right away because of delays in the completion of the new airport serving Lumbini Sajha Yatayat is using them in Kathmandu routes. Still, better late than never, Nepal has taken the first step towards electric public transportation. The government is setting up a special unit to promote electric mobility, and is installing 20 charging points around the country. 1 As we gather here today to launch the National Action Plan for Electric Mobility, I recall that during my earlier term as Prime Minister, we enacted the national policy for environment-friendly transportation. In line with that policy, the Action Plan we have launched today has the goal of spreading the use of electric transportation. 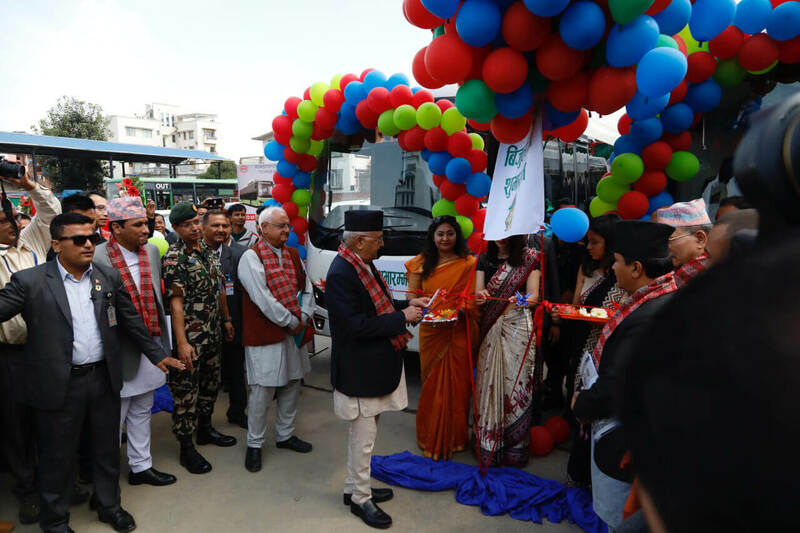 2 Today, the electric buses which have been made available to the Lumbini Development Trust by the Asian Development Bank are being handed over to the Sajha Yatayat cooperative company for operation within Kathmandu Valley until the international airport is ready in Lumbini. I thank the Lumbini Development Trust for this fine gesture. 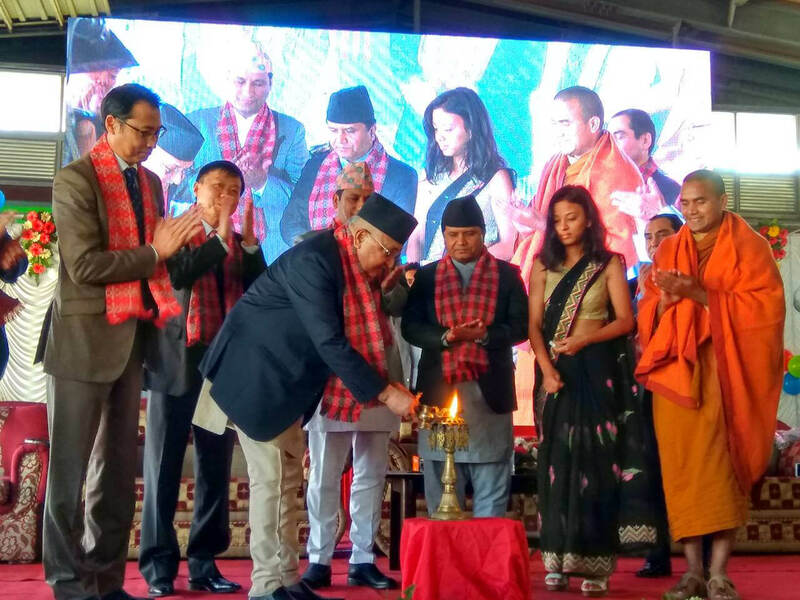 I am confident that the operation of the five electric buses in the Valley by Sajha Yatayat will succeed in generating interest of the populace across the country on the importance of clean energy. For this reason, I want to make clear that we are not only talking here about five battery-operated buses, but of the very direction towards clean energy that our economy should be taking. 3 Within the next few years, the country is going to be self-reliant in hydropower. Leaving behind our present reliance on petrolleum fuel, we will be entering an era in which hydroelectricity generated within the country will all at once benefit our economy, environment and public health. In the coming days, the conversion of public transport to domestically-produced electricity will help displace the ever-more-expensive imported gasoline and deisel in the transport sector. Just to take one example, I ask you to consider the volume of air pollution generated by the tens of thousands of deisel vehicles and more than 800,000 motorcycles in the Valley. Without doubt, the conversion to electric mobility will have significant positive impact on the environment and the health of our public. 4 As stated in the National Action Plan that has just been launched, the Government will establish a separate unit to carry out required activities for the promotion of electric mobility. In this context, as a start, the Nepal Electricty Authority is already proceeding to place charging stations in 20 points around the country in order to encourage electric transportation. In the meantime, I wish to inform you that the various governmental entities are in discussion on matters of financial assistance and creation of investment-friendly environment for the country-wide adoption of electric transportation. 5 Our goal is to ensure that at least 20 percent of overall vehicles nationally will run on electric power by the year 2020. Given the savings we will be making in the energy sector through conversion to electric mobility, our overall national goal is to reduce dependence on imported petrolleum products by 50 percent by the year 2050. 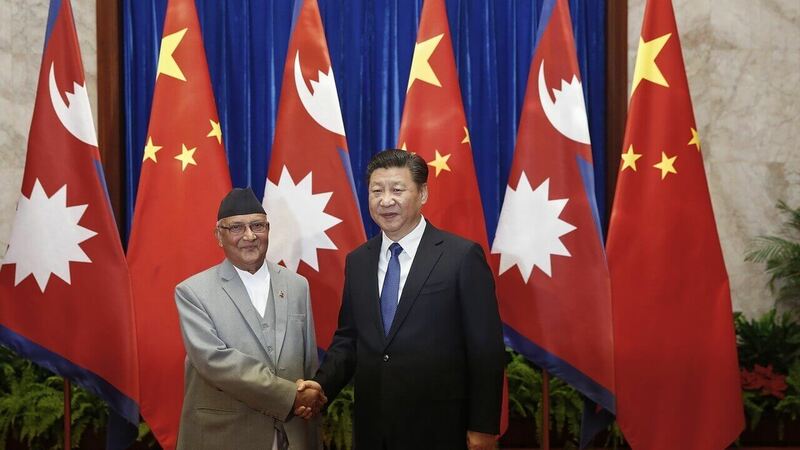 In this context, let me mention here the fact that both of Nepal’s immediate neighbours have committed to making their entire transport sectors run on electricity by the year 2030. 6 It is worth noting that use of clean energy shall make tomorrow’s Nepal even more attractive a destination for tourists from the world over. Transportation based on electric energy will significantly reduce air pollution. The clean environment resulting from electric mobility will improve the health of the public while simultaneously boosting the tourism industry, on which our economy is especially reliant. 7 I am confident that the electric buses that will start plying the roads of the Valley from today will write a story of success, which shall stimulate the introduction of battery-operated, environment-friendly transport in other cities and towns around the country. 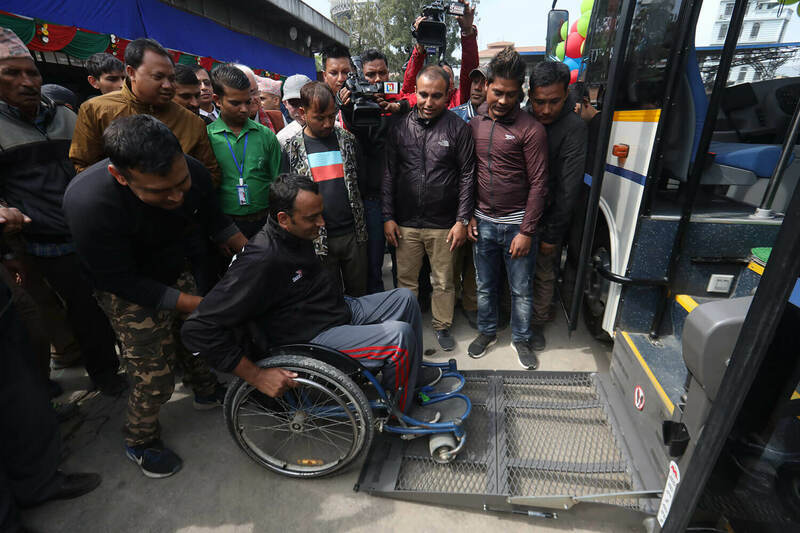 I am happy that these buses which have arrived in Nepal, produced by the well-known Chinese company BYD, are being operated by an much-admired Nepali organisation Sajha Yatayat. I am hopeful that this effort by Sajha Yatayat will act as a catalyst for the overall spread of electric transport in our economy. 8 This Government is committed to improving the standard of public transport in the country. The Government seeks to make public transport convenient, secure, clean and environment-friendly. Let me add that our goal will not be achieved by simply importing electrically-powered vehicles, and in fact we must contemplate the manufacture of electric vehicles and their components in Nepal. Here, the involvementof the private sector will be essential. 9 As I conclude, let me say that as a country rich in hydropower potential Nepal must take advantage of the great strides made by technology in the fieldof electric mobility. I take this occasion to appeal to the media to join the effort to inform the national citizenry of the social and economic advantages we will be reaping through the use of electricity-powered transport. I am looking forward to the day when Nepal gains reputation as the country of clean energy.